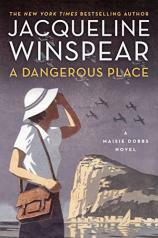 When last we saw Maisie Dobbs, in Jacqueline Winspear's 10th adventure featuring her intrepid investigator, our heroine was at a crossroads, struggling to decide whether or not to accept the marriage proposal of her long-time romantic interest, James Compton. Meanwhile, Maisie's world was also at a crossroads --- it was 1933, and lingering horrors remained in the memories of those who, like her, were involved in the Great War, even as the rumblings of fascism seemed to portend new and possibly greater horrors to come. Readers have been waiting for two years to find out where Maisie's choices would take her next --- in the meantime, Winspear published an excellent stand-alone novel set during World War I --- and finally, in A DANGEROUS PLACE, fans have the opportunity to catch up with their beloved sleuth. "The complex mystery plot is successfully positioned historically and politically while also working well on a more personal level." Unfortunately, the news is not good. In a surprising but dramatically effective stylistic departure, Winspear uses letters to provide glimpses into three years of Maisie's life since the last installment, years that have brought Maisie adventure, unexpected joy, and the greatest sorrow she has ever experienced. When Winspear returns to a more traditional narrative, we see Maisie reluctantly on the verge of returning to England, heartbroken and alone, fearful of how she will react to seeing familiar places and faces on the other side of nearly unspeakable tragedy. Rather than deal with that daunting prospect, Maisie --- who has taken to using morphia to dull her physical and emotional pain --- decides on a whim to disembark in Gibraltar, another place at a geographical and historical crossroads. There, as it turns out, she stumbles (nearly literally) on the dead body of a young photographer who has been beaten to death. The local police dismiss the case as a botched robbery committed by one of the area's many refugees, but Maisie, unsurprisingly, is not convinced. Gibraltar in 1937 is a dangerous place, positioned so close to Spain as civil war breaks out, serving as a remote rendezvous for communists and fascists alike. Maisie's investigation will lead her close to smugglers, spies, and even into the heart of the Spanish conflict. But the process of investigation, the work to which Maisie has devoted herself for so long, may also lead her back to herself. A DANGEROUS PLACE marks a satisfying and emotionally affecting return to this series. The complex mystery plot is successfully positioned historically and politically while also working well on a more personal level. And, especially for readers who have followed Maisie's evolution since the beginning of the series, this latest installment will prove emotionally wrenching, as readers yearn not only for Maisie to find the culprit, but also for some measure of healing for what she's gone through. A DANGEROUS PLACE ends with a bit of a cliffhanger, a suggestion that Maisie is not yet out of danger --- and her story is far from over.